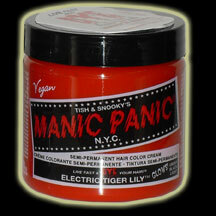 This semi-permanent Manic Panic cream is gentle to the hair and contains no animal by-products. It can be used to achieve intense bright colors on hair that has been pre-lightened tter on lighter and more porous hair. We recommend using our bleach kit we sell before use to achieve the best results(NEWESTSo a very light blond and on soThis semi-permanent Manic Panic cream is gentle to the hair and contains no animal by-products. It can be used to achieve intense bright colors on hair that has been pre-lightened to a very light blond and on some natural blond hair. Some colors particularly the darker colors, will give a highlight to natural unbleached hair and will be brighter on lighter and more porous hair. We recommend using our bleach kit we sell before use to achieve the best results.